Pro, Premier or Enterprise – Any Version, Any Year. 99.999% Guaranteed Uptime and 24×7 Free Support. QuickBooks Hosting by Ace Cloud Hosting provides a fully functional desktop version of QuickBooks on the cloud in a highly secure and robust environment. QuickBooks Cloud Hosting enables CPAs, accountants, and business owners to access their accounting files from anywhere, anytime and on any device. So, no more sending files back and forth over emails. 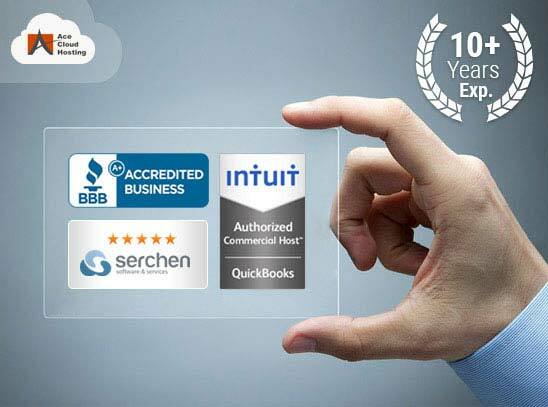 Ace Cloud Hosting is an Intuit Authorized commercial provider for hosting QuickBooks software on the cloud. We apply an organized and authentic approach with services to retain our status of being an industry leader for QuickBooks cloud for years. We are an award-winning application hosting provider, and our services are trusted by accountants, CPAs, and businesses worldwide. Ace Cloud Hosting offers attractive and affordable monthly leases on your QuickBooks licenses. We are the proud winner of Accountex USA 2016 Application Hosting Provider and 2018 Great User Experience Award by FinancesOnline. SSAE-16 Type II (SOC-2) Security audited servers with end-to-end encryption by Ace Cloud Hosting offers the utmost protection for your data while our ever-available hosted QuickBooks support assures a complete immunity from technical issues. With an experience of more than a decade in cloud services, we understand the client’s hosting needs better than anyone else, which allows us to offer the most convenient accounting QuickBooks hosting solutions for you – in the form of better access, security, mobility, affordability, and authenticity. All in all, Ace Cloud Hosting brings the most effective, super fast, secure, and reliable cloud environment to your business accounting. Your data is secure in the cloud with the highest security standards, including 256-bit data encryption, fully-clustered multi-tier structure and round the clock network monitoring. 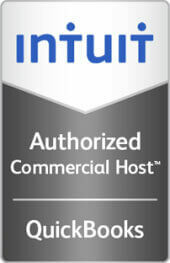 We have partnered with highly secure data centers. Protect your data with our continuous and automated backup solutions that ensure availability of data even in the event of a disaster or accidental file deletion. Ace Cloud Hosting maintains a rolling backup of data for 100 days without any additional charges. QuickBooks Remote Hosting with Ace Cloud Hosting will offer complete features of the desktop version without any change in the user interface or usability. Cloud will only enhance the accessibility and performance. QuickBooks in the cloud allows the users to go with as many deployments as they want. Our pay-as-you-go plans and scalable solutions allow the users to pick the right resources for hosted QuickBooks server to fit the add-on requirements. Our hosted QuickBooks solutions support all platforms and devices like desktops, laptop, and tablets. So you enjoy the freedom to work, get instant updates, and bring convenience to your work with QuickBooks Cloud Server. Our support experts are available round the clock to keep your QuickBooks up and running. You can reach us via call, email or live chat to connect with our cloud experts to get your queries resolved instantly. All this comes at no extra cost! We are an Intuit Authorized Commercial Host for QuickBooks, which verifies that Intuit has screened us for our QuickBooks Desktop hosting practices. Ace Cloud Hosting has partnered with US-based data centers that host superfast SSD-based servers to deliver the real-time actions on your QuickBooks with guaranteed 99.999% uptime for any number of active users. With more than 10+ years of experience in providing cloud-based QuickBooks solutions with the most genuine and safest of technologies, we've assisted numerous businesses with their accounting needs and maintained utmost client satisfaction. Ace Cloud Hosting is an A+ accredited business by BBB since 2014, which speaks for our ability to deliver customer-centric services. Which Versions of QuickBooks Do We Host? We host all versions of QuickBooks. Whether you are using US, UK, Austrian or Canadian editions of QuickBooks Accountant, Pro, Premier, Enterprise, and Mac, we have got you covered. All the editions till QuickBooks 2019 are totally compatible with our server set-up. How QuickBooks Works on Cloud? Your choice of QuickBooks version is installed on remote servers, which you can access using the secure login credentials using any internet connected device. Features and functions of QuickBooks on the cloud remain exactly same as on your desktop. We believe that strong support is the strength of any business operation. Ace Cloud Hosting provides customer support through live chat, email, and phone, even on weekends and holidays to deliver timely resolutions of QuickBooks cloud hosting troubles, such as – installation, printing errors, data migration, etc. You can also find answers to the most challenging QuickBooks on Cloud support issues from our Knowledge Base. Our experts have years of experience in providing remote IT support and possess an in-depth understanding of QuickBooks remote hosting solutions. For our potential with QuickBooks Desktop Hosting, reviews by our customers speak more than what we can describe in words. "We have been using ACE for over six years and their service and support has been terrific!" "I am very impressed with Ace's online support. Every time I have needed help, you specialists were able to resolve the problems very quickly." "The best customer service you can rely on. A real person answered the phone every time when I called and problems were solved within few hours the latest, even some time provide solution at the same time. I would highly recommend." Lindsay - Bay Area Fire & Safety, Inc.
"I Love Ace Cloud Hosting! This product has made it possible for me to work and manage the financials for this company across the state. I have recommended it to several other companies and they love it as well! There customer support is always on top of everything!" "We have used Ace Cloud Hosting for approximately 4 years now and have been provided very responsive support with 100% problem resolution!" "We are happy with our service and quick response to any technical issues that we have. We use QuickBooks, Outlook, Proseries and many other programs on the server."